Scallops in a Creamy Sauce, Thyme for Cooking healthy gourmet main course. Heat oil in a medium, nonstick skillet over medium-high heat. Add scallops and sauté quickly until they turn opaque, 2 - 3 minutes per side, depending on size. Sprinkle with lemon and paprika, remove and keep warm. Heat oil in medium saucepan. Add shallot, garlic and sauté until tender. Add beans, wine and 1/4 cup chicken stock to shallots and heat through. Remove and purée in blender or with immersion blender. Add more chicken stock if needed to get to a medium sauce consistency; the cheese will thicken it. Add thyme, 1/2 of the cheese and stir well as cheese melts. Combine pasta and sauce, arrange on a platter. 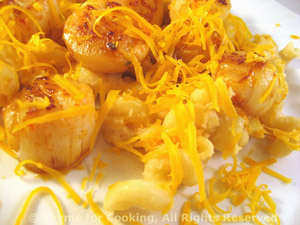 Add scallops, sprinkle with remaining cheese and serve.